I’ve been a bit remiss here on the blog, in that I haven’t formally introduced you to my latest self-published pattern. 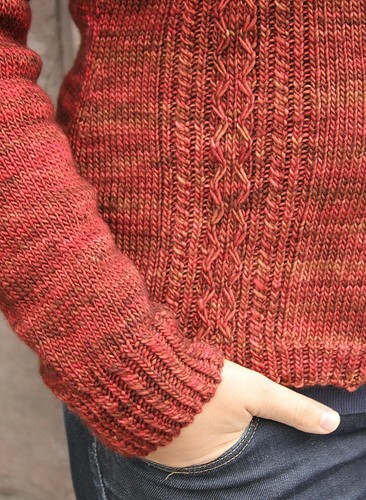 Allow me to rectify that, and present the Chatelaine cardigan, available in my Ravelry store or on Patternfish. This is what happened with that delicious pile of ‘sequoia’ coloured Madelinetosh Tosh Merino DK I purchased back in the summer – I decided it needed to be a nice fall cardigan, and am very pleased with the results! Allow me to thank Bridget from Needles in the Hay in Peterborough, for some on-location knitwear modelling a few weeks ago, I think she looks super in the cardigan. Chatelaine is a fitted cardigan with waist shaping, mostly stockinette (back and sleeves are all stockinette after the ribbing) with some fine cable details on the front panels. The scoop neck is just modest enough to keep you comfortable, and the button-bands and collar are all worked in twisted ribbing for a touch of elegance. Full sleeves are also just the cozy thing for fall. Everything is worked in pieces from the bottom up and then seamed together in finishing. This is suitable for DK-weight wool, at a gauge of 21 sts over 4 ins in stockinette. A relatively quick knit that doesn’t add too much bulk. My goal was to design a relatively simple cardigan that would still be a little bit dressy enough to wear around town. I really like how it turned out and am pleased to share it with you. I’ve got more orange sweater knitting to do (and others), but I’ll be back tomorrow with a giveaway post for you courtesy of Canadian Living magazine. Have a wonderful Thursday, everyone! It’s been a long time since I saw a sweater design and thought “omg i have to knit that!”. This was that moment. Thanks! It’s beautiful! I have never knit a sweater this is going to be my first one! Very pretty…anxiously awaiting your other orange sweater knit. Your designs are all so classic and timeless. Another winner and one that I may have to seriously consider adding to my “to knit” list. And you have such lovely models too. Glenna, I’ve been disappointed with how some superwash yarns grow when wet (I like to wet block my garments, sometimes while they are in progress). Any suggestions for success with a yarn like this Madelinetosh? I stumbled across this beauty on Ravelry and started to wonder if I had missed a post from you about it. Glad I’m not going crazy! The Sequoia color may just make it the perfect autumn cardigan. I enjoyed the interview in Canadian Living, and I’m looking forward to the giveaway! Simply stunning! I absolutely love the pattern — esp. b/c I’m kind of over top-down raglans and am embracing seaming these days. I’m thinking about subbing Ella Rae classic wool in aubergine (more of a winter than autumn look, but hey, it would take me that long to knit it!). Simplicity-plus! Just right combination. I love it! Good question! Superwash yarns do often behave differently from regular wool. This Tosh Merino DK didn’t have quite the drastic issue that plied superwash yarns do, but in general I recommend knitting a generous swatch first and seeing how it behaves after washing and drying. It find with plied superwash yarns I generally let them dry about 80% in the dryer and then let them air dry the rest of the time. With the Tosh Merino DK I allowed the sweater to dry flat as I would with regular wool – it’s a single spun yarn and has a bit of fuzzy loft to it that plied yarns don’t. Absolutely stunning !! Adore the colour, it’s just perfect for autumn. lovely cardi, will have to queue it after I knit the others from Skein theory. What a nice little emag, one of the very few patterns I have bought this year! 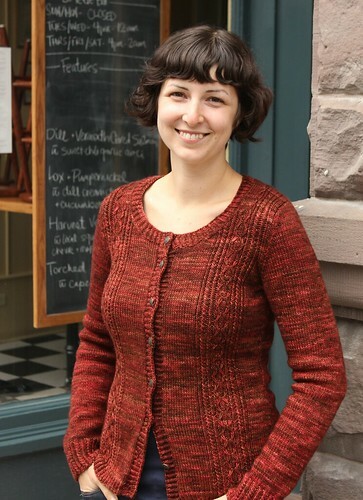 Lovely cardigan – I’ll look for yarn for it in Waterloo on Saturday. Glenna, it is lovely. The cardi, the colour and the model. Beautiful! I suspect this is beyond my knitting capabilities, but it’s something to strive for, especially in that lovely yarn. Have been enjoying your blog for a while now…I’m happy to have this chance to tell you so. Well done. This is fantastic! Is this the Rhinebeck sweater? Lovely, that one goes in the queue! The YarnHarlot sent me, I’m staying. Wow….really pretty..you’ve got me again..on my way to purchase! I love this sweater, but I’ve never done cables. Is it a good starter or should I try something simpler first? So pretty & gorgeous….love the colour!! beautiful cardigan! I’m going to add it to my ravelry queue!